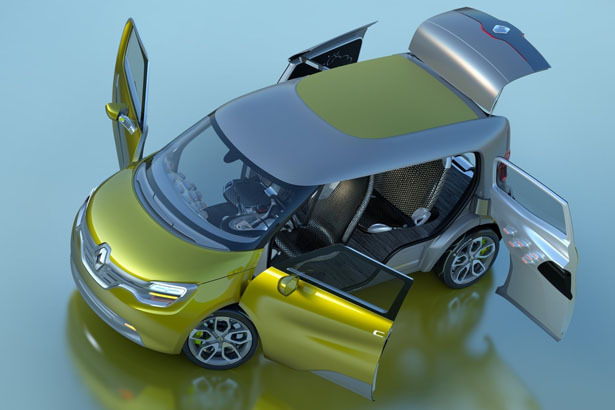 Renault Frendzy car is the 4th step in Renault’s new design strategy which launched in 2010 under Laurens van den Acker’s direction. 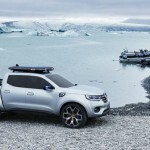 Their design strategy is based on the human cycle of life starting from fall in love (Renault DeZir), head off on a journey (Renault Captur), family (Renault R-Space), work (Renault Frendzy), play, and wisdom. 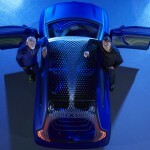 Thus, each concept car they have revealed since 2010 represents a phase of that cycle. 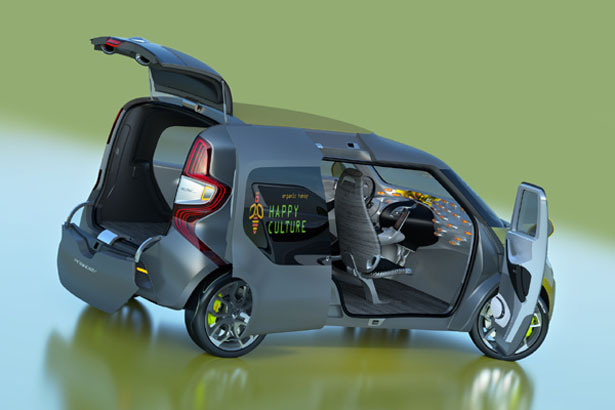 Frendzy car has been designed with focus on creating an efficient and modern work tool, at the same time still sporting and welcoming the family. 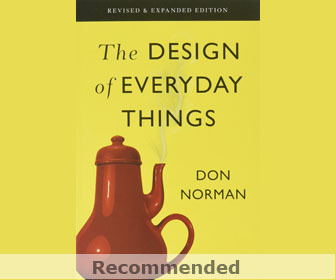 As a professional, you also have personal live which usually intricately connected to each other. It makes you jump from one world to another. 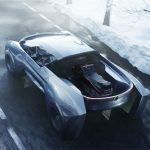 This concept car reflects a dual personality to take the stress out of this lifestyle. Frendzy is here to be your perfect partner. There’s only one conventional and one sliding door on passenger’s side. The sliding door incorporates a 37” widescreen display. There’s no center pillar inside this car, the center opening door represents the world of the family also ease of use when loading. A perfect entry for both worlds. The large external screen can be utilized to display messages or information such as “making deliveries “ or “back in five minutes” or even as advertising messages. There are sensors located on each door to log all your loading or unloading packages with RFID chips. It gives the driver important information such as what’s inside the package, destination address, weight and dimensions. 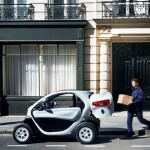 It also gives the user a real-time inventory of goods being carried in the vehicle. That’s why Frendzy is a great vehicle for business user. 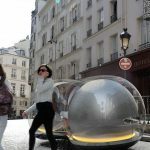 On the weekend, this electric vehicle can transform itself as a family car with a big bench seat at the back, comfortable passenger seat next to the driver’s seat. Children can watch a film or play games through a touch-sensitive pad which slides out from the back of the driver’s seat. 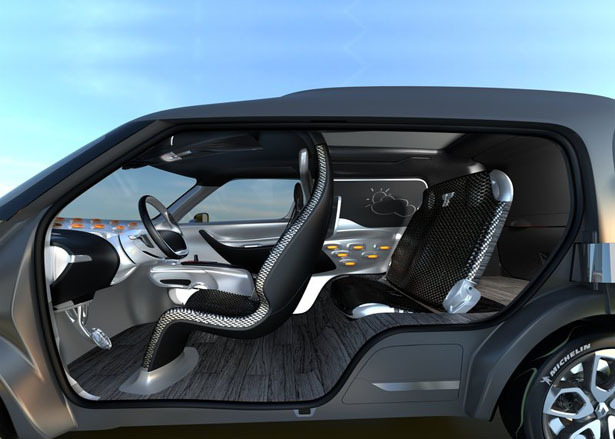 The futuristic technology of the interior can transform the atmosphere from work mode to family mode. In ‘work’ mode, the rear-view mirrors sit upright and the interior lighting is green; in ‘family’ mode, the mirrors swivel round to the horizontal position and the interior is bathed in a radiant orange ambience. 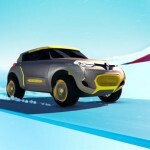 Renault Frendzy will be on display on the Renault stand at the 2011 Frankfurt Motor Show! 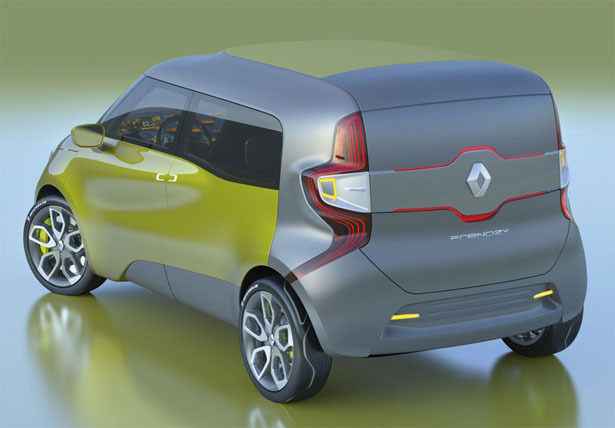 This entry was posted in Cars, Designs and Concepts, Green, Renault. 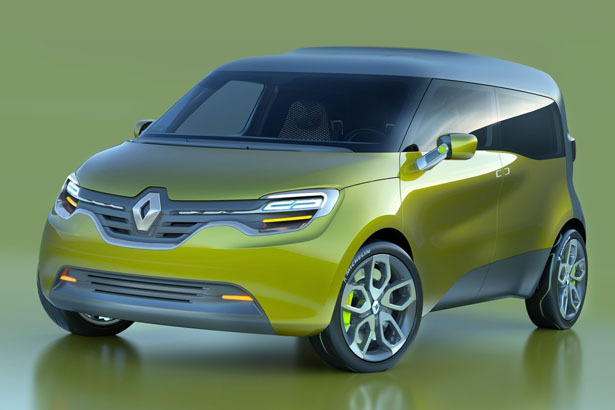 Tagged as bench seat, center pillar, concept car renault, cycle, door, dual personality, seat children, Strategy, vehicle, work. 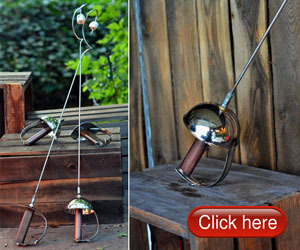 Very cool design, love it. Hope it sees production. Love the interior looks very futeristic and then there is a pedal – a retro looking brake pedal or something to remind you its actually from this planet. Cool. I love the car, Its really awe sum my eyes are still stunned by seeing it, what an cool structure, really an amazing one, thanks for sharing such an amazing pics. wow that was sweet but wouldn't get it!